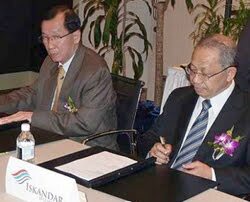 Property developers Dijaya Corp Bhd and Iskandar Water Front Sdn Bhd (IWSB) will jointly develop two parcels of prime waterfront land at Danga Bay, Johor Baru, into a mixed development project that carries a gross value of RM3.8 billion over the next 12 years. 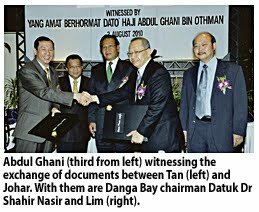 Goldhill Quest Sdn Bhd - a 60:40 joint-venture between Nagasari Cerdas Sdn Bhd (a wholly-owned subsidiary of Dijaya Corp) and Global Corporate Development Bhd, which is wholly-owned by IWSB - yesterday sealed the deal to purchase the land for the project from Danga Bay Sdn Bhd for RM308 million or RM190 per sq ft.
Dijaya was represented at the signing ceremony by its chairman Datuk Rohana Mahmood and managing director Datuk Tong Kien Onn, and IWSB by its chairman Johar Salim Yahya and chief executive officer Datuk Lim Kang Hoo. “The time is right for us to come to Iskandar in view of the good progress in the economic growth corridor since its launch,” he said at a press conference at the signing of the sales and purchase agreements for two parcels of land, totalling about 14.97ha in Danga Bay, for RM308mil. PETALING JAYA: KYM Holdings Bhd has mutually agreed with Harta Makmur Sdn Bhd and Vale Malaysia Manufacturing Sdn Bhd to extend the cut-off date for a sale and purchase agreement (SPA) involving 13 parcels of leasehold properties to Aug 31. In a filing with Bursa Malaysia yesterday, KYM said the parties had signed a conditional SPA on March 31 pursuant to Vale exercising its option to purchase the properties, totalling 305.94ha, from KYM’s 54%-owned unit Harta Makmur for RM93.76mil cash. Harta Makmur last year sold 485.6ha of leasehold land in Teluk Rubiah to Vale for RM195.7mil.year. In a separate statement, KYM said its wholly-owned unit KYM Built Sdn Bhd had on July 29 accepted a contract from Vale Malaysia for the refurbishment of a building for the use as a site office and upgrading of the main entrance at Teluk Rubiah, Perak for RM300,265. “The contract is expected to commence next week and will be completed within a month. “None of the directors or major shareholders or persons connected to the directors or major shareholders of KYM has any direct or indirect interest in the award of contract,” it said. HONG KONG: Hong Kong home prices will rise another 15 per cent in the next 12 months as limited supply forces buyers to pay more for property that’s already expensive, CLSA Ltd’s Nicole Wong said. Prices will increase because the city’s promising job market and growing wealth will help drive demand for real estate while supply doesn’t increase much, Wong, the regional head of property research for CLSA, said at a media briefing yesterday . “Is Hong Kong real estate too expensive? Definitely,” Wong said.